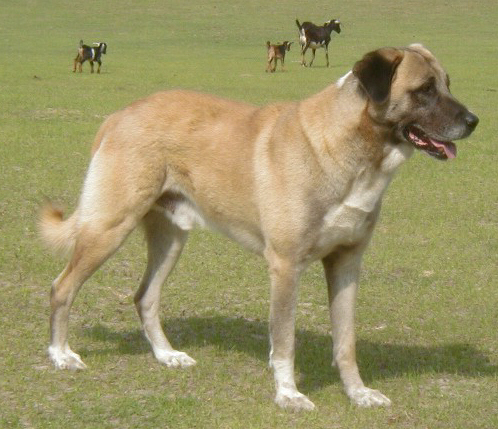 The Anatolian Shepherd Dog is one of the most majestic and noble animals in the service of man; still being used in the rural districts of Turkey after thousands of years as the shepherds' indispensable companion and front line defense of his livestock from predators. He is a livestock guardian dog, living his life in constant association with his sheep or goats, and is accepted as a member of the flock. These dogs are NOT herding dogs, but are extraordinary protectors of whatever they deem as "theirs". We started with Anatolian Shepherd Dogs in 1997 when we acquired our first dog as a guardian to our Nigerian Dwarf Goats and Miniature "Babydoll" Sheep. Since then we have dedicated ourselves to producing outstanding working livestock guardians. Our breeding program has been based on selecting breeding stock with correct structure and conformation to perform their job, strong natural working ability, and excellent temperaments. We strongly believe that preservation of this magnificent working instinct is of the utmost importance, and we do not breed any dogs that do not display proper working ability and temperament. We now have pups in working homes across the USA, guarding a variety of livestock and doing the job they have been bred to do for thousands of years.